Therapists with experience or training are aware of these and other adaptations for cancer treatment. Be sure to see a massage therapist who asks about treatments during the interview and who explains any needed massage modifications. A skilled therapist will combine a thorough intake process with sound clinical judgement and clear communication about what to expect in the session. She or he will adapt the massage to your needs and requests, fashioning a hands-on session that relaxes, energizes and reduces pain and discomfort. An old myth warned that massage could, by raising general circulation, promote metastasis since tumor cells travel through blood and lymph channels. We now recognize that movement and exercise raise circulation much more than a brief massage can, and that routine increases in circulation occur many times daily in response to metabolic demands of our tissues. In fact, physical activity usually is encouraged in people with cancer; there is no reason to discourage massage or some form of skilled touch. Massage is practiced widely at the Dana-Farber Cancer Institute, Memorial Sloan-Kettering, and growing numbers of hospitals around the country. Metastasis is not a concern; instead, patients and researchers report countless benefits. 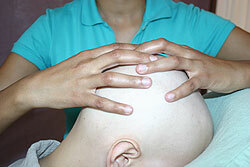 (click to read an excellent article about massage and cancer spread). Massage has many benefits for people living with cancer. A few are listed, below. We know some of these from clinical observations, some from controlled research, and some from what clients tell us directly. Again and again, clients tell their massage therapists that massage improves their energy level and helps them sleep better, and clients in cancer treatment are no exception. But sleep can be especially hard to come by during cancer treatment, and cancer fatigue is common and poorly understood—a difficult symptom to treat. People in treatment, often with a high degree of symptom distress, are especially in need of good sleep. At least one study shows massage facilitates sleep.